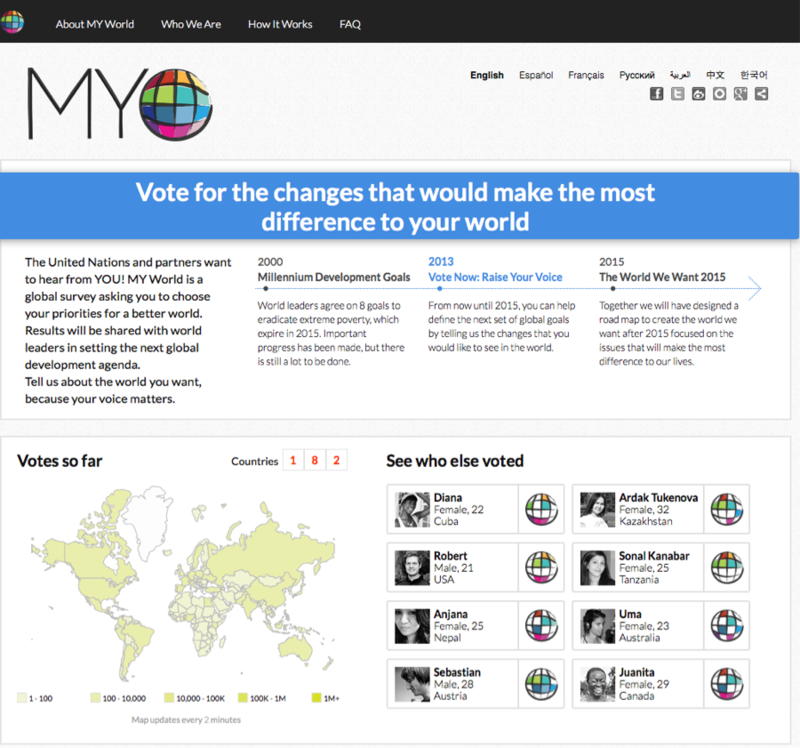 Myworld2015 asks all of us – that’s right, all of humanity — to vote for the changes that would “make the most difference to our world.” We get to vote online for the priorities that we believe to be most important – they provide us 16 options, and we are asked to select 6. And on our honor, we vote just once. Sometime between now and… 2015. It’s a crowd-sourcing scheme for defining the “next” set of goals (presumably after we discover how many of the millennium development goals go unmet). Good idea for participatory development? Interesting attempt at making all of us citizens in one big global democracy? It’s certainly well intentioned, but maybe not so well-thought-out. It’s not clear from the website how the votes are going to be tallied or interpreted. At the moment, I see that there are almost 1500 votes from the U.S., and just 208 from Nigeria and 596 from India… let alone 3 from Congo. What happens when voters from the global North click through that they want to prioritize climate change, gender relations, and freedom from discrimination; and those from the global South want jobs, clean water, and affordable food? Especially if those from the global North with exponentially greater access to the internet dominate voter turnout? OK, maybe I’m taking this scheme too seriously, but if the UN, ODI, and others are going to make the case that they want to listen to the whole world’s views on such important matters, I hope they are prepared to deal with the messiness that much smaller democracies face. Not only are the world’s priorities likely to be highly heterogeneous, but their scheme is likely to highlight that the rich minority of citizens have quite different policy preferences than the majority poor — even if one assumes that the types who are likely to vote are going to be disproportionately cosmopolitan in outlook in the first place. And if the goal of the exercise is solidarity, one has to wonder if this all might backfire? And of course if they take the vote and then hide the results because of turnout disparities or polarization of priorities, well, that won’t look very democratic after all. I agree with a lot of concerns raised in your blog above. I would like to offer my two cents worth, to the point where you raise a very valid concern – if the UN, ODI and other partners “are prepared to deal with the messiness that much smaller democracies face”? I work for the Scout Movement, with over 30 million members across 200 countries and territories – coming from different socioeconomic backgrounds. We have partnered with My World to help get inputs from across our membership – gathering votes not only from our young members, but also from people in their communities. Together with UNMC we are also committed to majorly extend offline methods through printed voting cards that we and other youth organisations such as the Guides, YMCA, etc will get filled from communities and Scouts themselves, particularly in the global south. From my understanding, the votes are not going to be the final Dictum for the Post2015 Development Goals, but will largely inform the key decision makers. Although not very explicit on the website, I also think that My World (and all the other consultations going around) plays a big part in bringing various stakeholders on board quite early in the process, unlike what happened with the MDGs – which affected the progress in the early years. I am curious though, to know more about your thinking on how if this was a solidarity exercise, would backfire? I am not sure this was the intention at all, but am interested to learn from your thoughts. Many thanks for the comments — you make many good points. But my concern still remains: if the project simply reveals that the world is polarized in terms of its priorities, which I suspect it is, it’s not clear how that information will be used. Of course, it makes good sense to try to better understand what kind of world people want, which is the idea of the initiative, I think. But it’s hard to imagine a scenario in which a clear set of priorities will emerge, and the exercise could lead to more conflict and paralysis then action. I hope I am wrong! Thanks for the write up. The data has just started coming in (take a look for yourself in real time here: http://data.myworld.org). While it is true that priorities are literally “all over the map” and that it will be hard to choose a few representative goals, it was mandatory to give everyone a voice, and then be able to show the local, regional and other clusters to improve decision making. Thanks for your comment. And I really do applaud the initiative to give citizens greater opportunities for input. But it would be helpful to hear more about how this information will be inform decision-making, especially if, as you point out, preferences diverge widely. It’s simply too easy to imagine a scenario in which decision-makers are presented with highly inconclusive data concerning what citizens from around the world actually way, and then in turn, they will need to make priorities based on other factors. I don’t want to be overly skeptical, but all-too-often I observe various forums in which international organizations solicit input from “stakeholders”, without any clearly specified process for incorporating those preferences into decision-making.